today I bring you a very special giveaway with a special project behind it, my friend Talia Rodriguez owner of Artist of the Falls came to me to see if I can help her as she is opening up a second art studio in Coral Gables, FL and is looking for assistance to be able to make this happen. I met Talia last year when my photographer Sasha set up a girls night at her Art Studio (see post here). 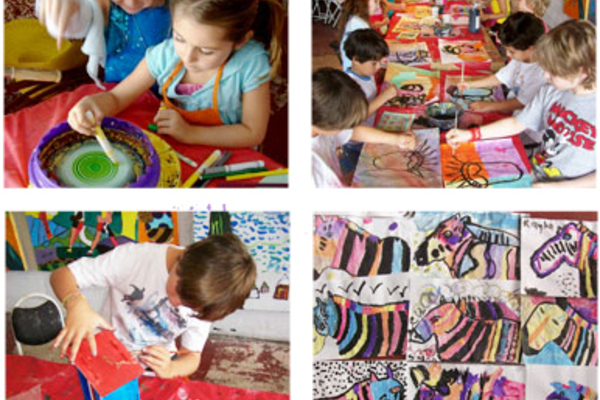 Her art studio already serves for a wonderful space for people of all ages to express the love for art, even more so the time to have children express their creativity in a positive and fun way, develop their skills and prepare them for a professional career in art. In addition to all these services in her current studio, she has provided art supplies for underprivileged and sick children in foster care programs, hospitals and after-care centers through an annual Art Collection Drive. She is looking forward to be able to provide free art classes, organic body products and paintings, among other things. So you can see why I couldn't say not to her, I had to find a way to assist her in the process as I am a believer in helping those who are doing positive things in our communities, especially when these places are harbouring creativity for children. now the info on the giveaway, Talia is graciously giving one of my readers the chance to win a gouache illustration as the one pictured above. Below are the rules to enter the giveaway. Give a donation (any amount is welcomed), follow the link Artist of the Falls 2. Share your donation (it will give you that option once you have donated) and hashtag #chicgiveaway. Leave a comment on this post (below) to let me know you have donated. Winner will be picked at random by Talia and myself. Giveaway ends March 15, 2013, winner will be announced on March 18, 2013.